Posted by Jon in Hobbit, SDCC 2013 with 8 comments. Summer sounds like a great time to kick off The Hobbit: Desolation of Smaug merchandising campaign. 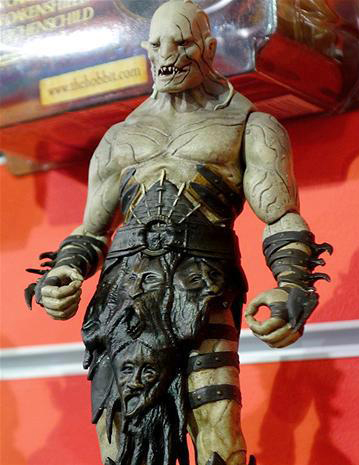 Bridge Direct is doing just that by announcing their San Diego Comic Convention exclusive for 2013: Azog the Defiler. Like any smart company these days they are taking advantage of a mold that can be reused and since Azog is seen in the prologue with both of his hands. This version of Azog will have an interchangeable stump, or a hand holding the severed head of Thror. 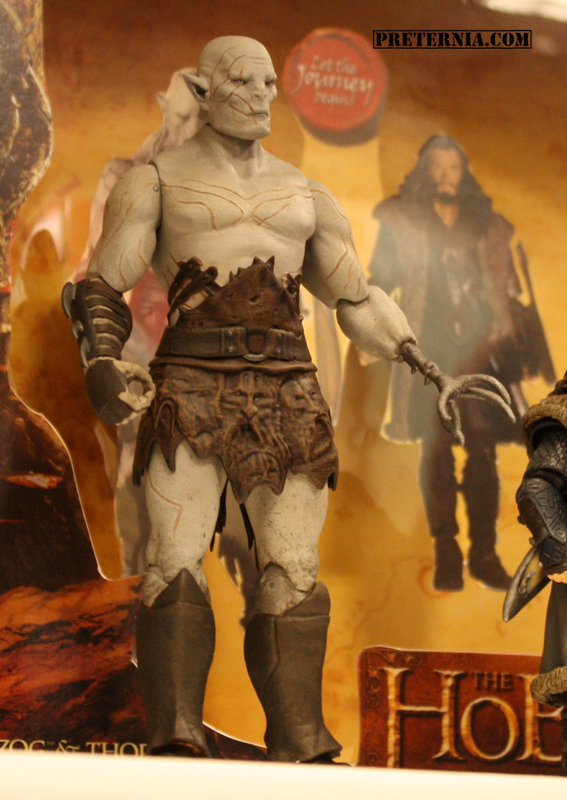 Azog will be roughly 7″ tall and will be in scale with Bridge Directs orther 6″ scale action figures. He will be strictly limited to 2,600 pieces. Bridge Direct will release pictures on June 13th, but for the time being we can go by UK and US Toy Fair pictures to basically piece together what he will look like. So there you have it folks and Laurence, the mystery is solved. From their clues I was expecting either the Necromancer or Azog. My first guess was wrong! Make sure to check out our SDCC 2013 checklist because it is constantly being updated with new items including this one. This and it seems they want to keep a lid on what he looks like so they probably don’t want to give it away five months before the film. I’d be surprised if BD gets out a Smaug this year, I’d guess for their third movie series. Yeah that’s exactly what we’re talking about but BD said via a FB message i got saying pics of Smaug will be previewed along with his prototype at SDCC .Thanks Jon and you never know! I think he is gonna be made in some Wave or Wave 2 itself and i know that for sure as i got this piece of info from BD and they said they guarantee Smaug will be made, but as to what wave is unknown. Thanks and i will keep you posted on this!